Colocassia /Taro root is called as Cheppankizhangu in Tamil. 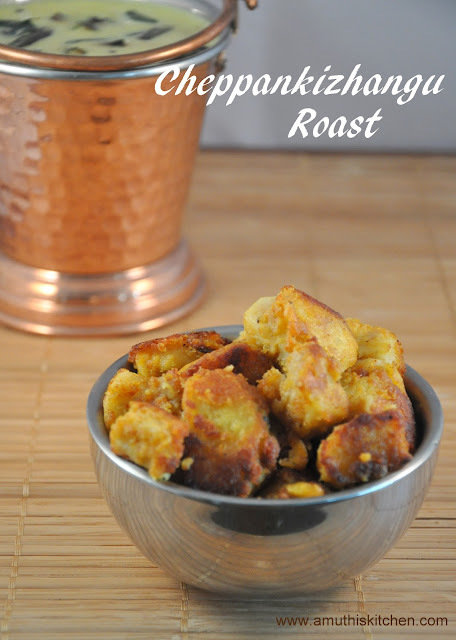 Cheppankizhangu roast is a perfect accompaniment for Mor Kuzhambu.Typically this is deep fried. However I prefer shallow frying in a Tawa. 1. Wash and cook the cheppankizhangu in a pressure cooker with enough water for 2 whistles. While mixing the spices 1 tsp of tamarind water can be added. Never tried it with besan and rice flour. Looks tempting. First time here. Very nice space you have. Loved to follow you.